We are taking it granted that who is reading this guide followed the steps like described in our guide for the setup of Nginx WordPress installation and website is already HSTS. 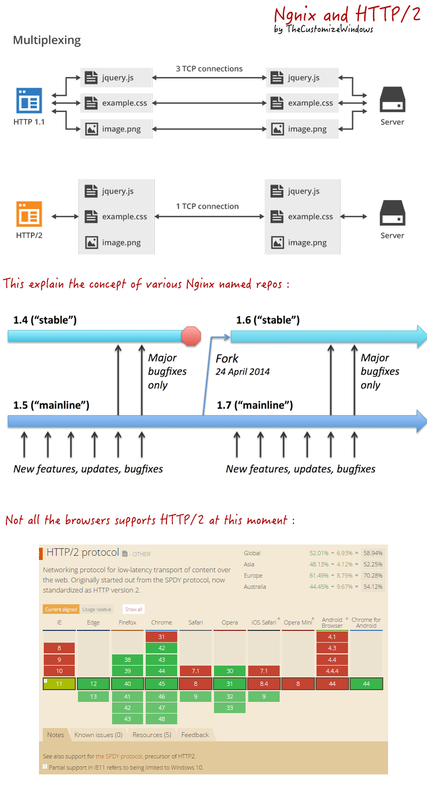 Here the Steps to Upgrade Nginx for HTTP/2 Support on Cloud Server Running Ubuntu OS from Nginx with SPDY. We DO NOT recommend this upgrade on production website at time of publication of this article (4th April, 2016). Still, we are taking it as a working development site which needs some backup. Normally we suggest to use apt-get install nginx-extras command to install Nginx Community Version from Debian Repo. nginx-extras has all the needed modules including cache purge module. As nginx-extras is intended for the advanced users, nginx-extras at this moment has no support for HTTP/2. It supports SPDY. For Nginx with HTTP/2 on Ubuntu 14.04 KTS, we can use the ppa:nginx/development repository, which is clone of the Nginx MAINLINE branch. From this MAINLINE, Nginx Plus is developed. As a normal webmaster does not have 2-3 dedicated software engineers for bug checking and other matters, at this moment, we actually do not suggest this upgrade for production site. Other way is to use Nginx Plus. After paying $1700 per annum for Nginx Plus, obviously there will be custom support. Cloud Flare or other bigger websites has dedicated team to manage the software development part. SPDY is enough at this moment for production sites. This Article Has Been Shared 7867 Times! We Tested Linode Cloud Server Review Taking HP Cloud Standard. Free RedHat OpenShift is better for testing, OVH is better for cost reduction. Cite this article as: Abhishek Ghosh, "Steps to Upgrade Nginx for HTTP/2 Support (Ubuntu, Cloud Server)," in The Customize Windows, April 4, 2016, April 25, 2019, https://thecustomizewindows.com/2016/04/steps-to-upgrade-nginx-for-http2-support-ubuntu-cloud-server/.